Edit: Gave it the rigorous and scale bar treatment, changed to my contemporary pose, updated the silhouette and made some minor adjustments to pectoral girdle position. I just want to say that I think it's fantastic that you keep your skeletal reconstructions so up to date and easy to access. And your work is always of fantastic quality. It's a fantastic resource for any aspiring paleoartist. So, great job! Thanks! It does take more and more time to update as I accumulate more of them, but it hasn't broken me (yet). Hi Scott, same question. 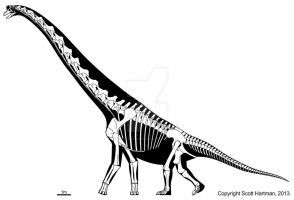 Can I purchase the JPG file (or from anyone of the dinosaurs from the Hadrosauridae family you have listed)? I just finished prepping a femur from what we think is an Edmontosaurus down at the Science Center. 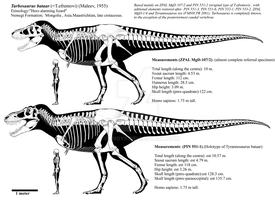 Your artwork clearly shows the femur and the one I worked on looks to be about he same size according to the 1 m scale. 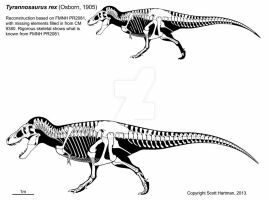 Would Maiasaurus be a valid name to give to another taxon? I would think so...just like Ultrasaurus and Ultrasauros were considered different enough to be valid. Was this isolated specimen also found in the Two Medicine? 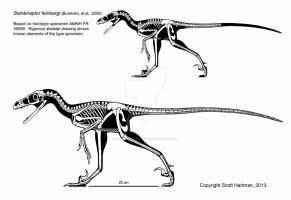 Not that aesthetics really matter of course, but I do note that your restoration seems better proportioned and less ungainly looking than GSP's as shown in his "field guide". Agreed on all accounts (although I'm admittedly biased). 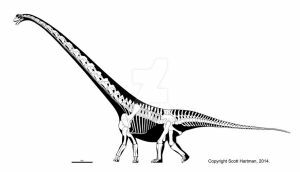 I will say that the proportions of his Brachylophosaurus both look ungainly and are not correct (I personally measured all of the complete specimens, so I'm quite certain). 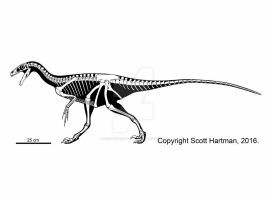 Wait, they had lacrimal horns like a theropod?? And it's a single horn between the eyes. Interesting spinosaur-like head crest, I never knew it had that. 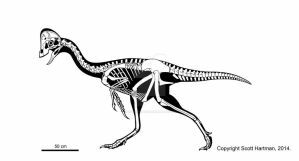 Well, the crest is oriented more transversely than in spinosaurs (that is, it is oriented across the skull rather than along the snout). Yeah, there's a beautifully preserved skull and it shows the sharp downturn. 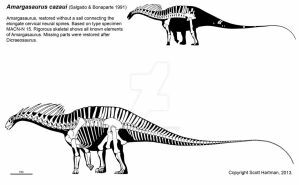 It's not so crazy different from Brachylophosaurus though, it's just different from the original attempts to reconstruct the skull from incomplete and disarticulated remains. I guess it would look far less strange if it had the skin on. Man, you are one of the best guys out there for paleoart! I love your gallery and I use your skeletals quite frequently. 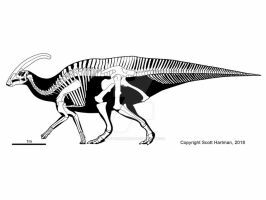 Is there any evidence for a dewlap in any other hadrosaurs? 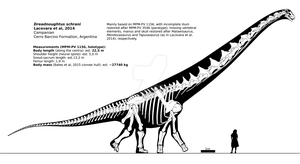 For example, is the ''crop'' that they talk about for Leonardo the Brachylophosaurus a dewlap? Or is it just an organ in the throat? Thanks for the kind words. 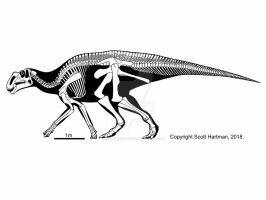 There is no direct evidence for throat structures in other hadrosaurs at this point. 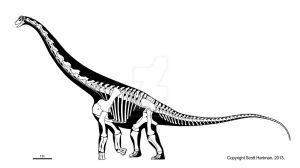 The crop is an early part of the digestion system in some archosaurs that is quite anterior in the body cavity, but not actually in the throat. That doesn't mean they couldn't have had dewlaps, just that there isn't any preserved indication at this point. Great skeletal, it's interesting how the pubis is nearly horizontal. 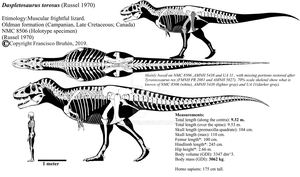 Is there any evidence that the skull of the ROM specimen is distorted? 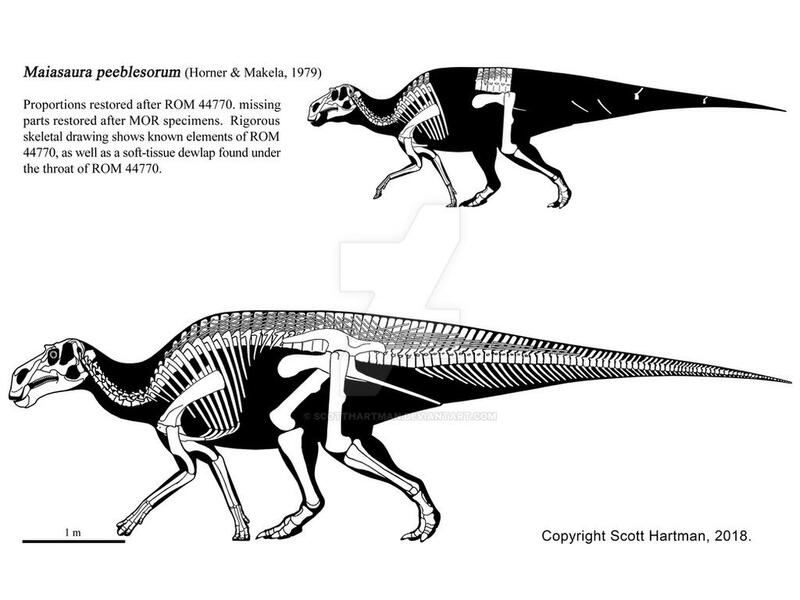 The original MOR specimens all have much less sloped maxillaries and nasals. Should I just presume that this is a case of intraspecific variation? This is a great ref, as always. I use it frequently! No, the ROM skull is pristine. There is ample evidence that the MOR skulls are distorted and mis-restored. I would ignore the MOR skulls altogether. 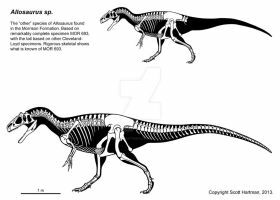 There are several MOR casts on display in the WDC, and it's obvious that the skulls looked like the ROM specimen prior to burial/butchering. 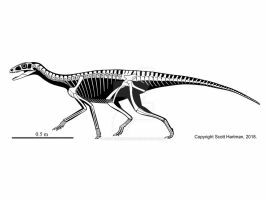 That said, I use the MOR specimens for most of the postcrania, I used the ROM specimen for scaling, since it's the only specimen that doesn't come from a disarticulated bone bed. Interesting. 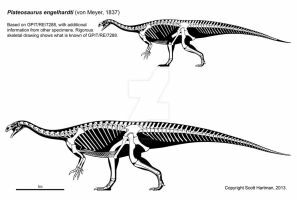 I guess that means the morphology of the skull is even more similar to Brachylophosaurus with that more hooked rostrum. Thanks for the input, Scott. Great ref as always, Scott.